Pickleball is a popular sport that is played with racquets and combines elements and features of a number of other games and sports including badminton, tennis and table tennis. Using solid paddles of wood, players play on a court that is bisected by a net and try to hit a ball that is very similar to a Wiffle Ball over it to score points in a fashion similar to both badminton and tennis. Pickleball is a relatively young game and was invented in the 1960s and was popularised as a children's pastime but over the years it's become more and more popular amongst adults as it is a fun and enjoyable sport that is suitable for anyone of any age to play. It is an unregulated sport and there is no international governing body. The object of a Pickleball match is to win the game by scoring more points than your opponent. 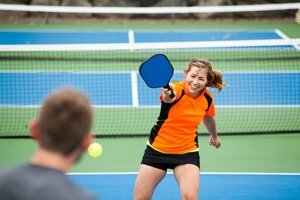 Pickleball as a game itself though has a larger objective for many people and that is as a game that can informally introduce people to games such as tennis and badminton with greater ease. Pickleball is also a popular way of bringing racquet sports to the disabled as there are a growing number of wheelchair leagues and competitions starting across the world. Pickleball is played on a badminton sized court with a raised net in the middle of the court. It is traditionally played with special Pickleball paddles that are made of wood (or other more hi-tech materials). The ball used is plastic and is very similar to a Wiffle Ball but is usually slightly smaller. Because the game is unregulated and not usually played in a highly competitive environment, there are no hard and fast rules concerning equipment and suitable alternatives may be used. In terms of players, the game of Pickleball is played one-on-one (known as singles) or two-on-two (doubles). If a non-serving player’s opponent commits any of the above, no point is scored. The game is won when one side is first to reach a score of 11 and is leading by at least two points. If a side reaches 11 points but is not two points ahead, then the game continues until one team is two points ahead of their opponent. For this reason, it is impossible for a game of Pickleball to end in a draw. In some tournaments, a points score of 15 or 21 may be required, along with the 2 point rule. Pickleball is played on a badminton sized court that has a net in the middle. It can be played as singles or as doubles. The game begins after a coin toss to decide which side serves first. The ball should be served diagonally and should be done so underhand, with the paddle below the waist and both feet behind the back line. The serve must clear the net and land within the opposition’s playing area. The receiver of the ball just let the ball bounce before returning the serve, and then the server must also let the ball bounce before returning. If playing doubles, only the player served to can return the ball. If the ball is touched by their partner, then a point is scored by the serving side. If a serve strikes the net, this is called a let and other serve is performed. Unlike tennis, there is no limit to the number of times that this can occur. There is a non volley zone that is a 7 foot zone on each side of the net. No volleying can occur in this zone, preventing players playing a smash shot to their opponents. Volleys may be performed outside of this zone, and non-volleys can be hit within it. Serves alternate until one side reaches a score of 11 (or 15 or 21 if agreed earlier) and has a clear two point lead. The side doing this is declared the winner.